I deliberated over how to present Assignment 2 – Ephemerality of the Image in my head for some time. Originally it had been requested by the course to present it in an online format and I feel it still works well in this format. However, I have decided to present the single-image narratives as singular prints too. My reasoning for printing the images as well is two-fold. Firstly, I feel the project possesses greater impression for potential viewers because of the size I have printed the images. I printed them A3 sized which is comparably large. With the images online it is still possible to view large and even zoom in on the singular images but I feel seeing an A3 print leaves a greater impression for these images. The fact that the images incorporate Polaroid/Instax images within them (which are usually intrinsically a much smaller format) makes the impact of being printed so large greater. Secondly, printing the images showed better the ephemerality of the image as the images were then put together in their printed forms to make a larger picture. The images that make up the final photograph became part of a moment that consisted of myself holding a frame against a dark background containing the smaller images. This moment has now passed and all that’s left of that moment is another image. To better convey this in the prints, I purposefully left large white borders on the singular images to imitate Polaroid/Instax borders. This was in order to further convey the picture-in-picture message and also lead up to the final photograph where all the images appear with my hand holding the frame. In the final photograph the large white borders were still evident which was contiguous with the singular images I’d printed leading up to this final photograph. I have received feedback from my tutor regarding Assignment 2 – Documentary – Ephemerality of the Image, which I found very helpful. Some points my tutor picked up on in my assignment were the fact I appeared to be gripping on to the picture frame in the final shot as well as the photos inside the frame being attached quite strongly. I would like to have said I was intentionally holding onto the photo frame very firmly so as to symbolise my subconscious wish to hang on to the photograph in its conventional printed form. Practically, I was holding onto the frame firmly because it was quite heavy and I had to maintain a firm grip in order to keep it upright! Also the photographs were printed and hung firmly onto the frame so that they wouldn’t easily fall off and to make the grid structure of 4×2 obvious. It could also be said symbolically the printed photograph is ‘hanging on’ to its existence in the ephemeral world of today and so they were clinging on to their place in the frame. So although I must admit I wasn’t aware how firmly I’d attached the photos to the frame or my gripping onto the frame with my hand, these points observed by my tutor which I now see in my work, pointed to powerful and pertinent questions surrounding the printed photograph and its place in today’s society. 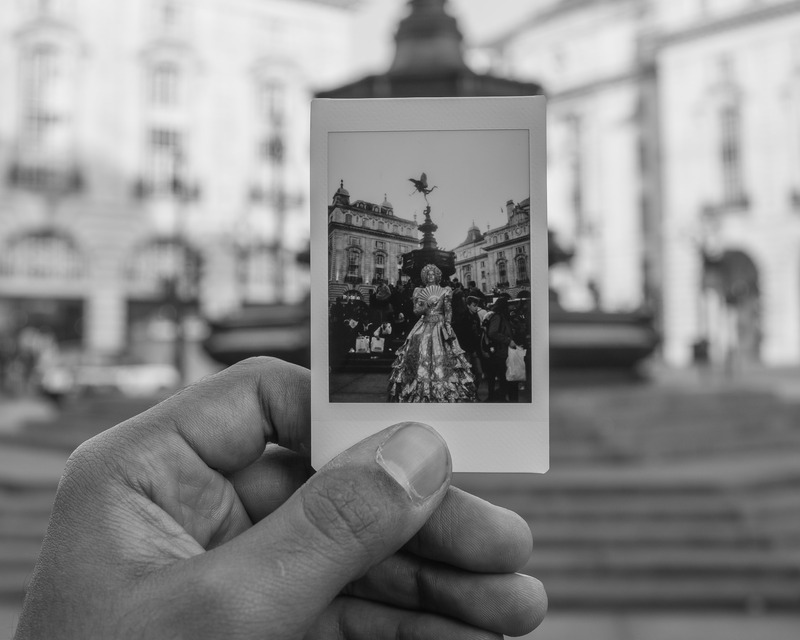 Questions like: are photographs even printed that much nowadays and if so do we cling onto them in the more traditional sense (in a picture frame)? Whether my frame with the 4×2 grid of prints inside worked best rephotographed on a blog or simply to be seen in the flesh hanging up somewhere is another point of consideration. On reflection I would suggest it would work hung up in a dark environment in reality as well as displayed on the blog because the dark surroundings in both cases symbolise effectively the highly transient environment the photograph now finds itself in. However, I would be inclined to say rephotographing it for the blog format worked slightly better as it was more in keeping with how my intended target audience would be likely to view the image(s). One other observation my tutor made was asking whether I had been influenced by the front cover of Stephen Shore’s (2007) ‘The Nature of Photographs’ primer in creating my project – ‘Ephemerality of the Image’? I had in fact seen the cover for Stephen Shore’s (2007) ‘The Nature of Photographs’ before but had since forgotten about it! However I think it has a very similar aesthetic and message to my assignment. Coincidentally Shore himself seemed to be gripping onto the photograph quite firmly, perhaps to signify the same message as me; that the photograph is quite frail in its physical form. This is all the more true in the even more ephemeral world of the image today than back in 2007. Shore, S. (2007). The Nature of Photographs. 2nd ed. London: Phaidon. Here I have attached my tutor report for Assignment 2 – Documentary. This is so the viewers of the journey I’ve taken through my course are able to see how I improved on the comments I received for Assignment 2 (and coursework) from my tutor in terms of presentation. 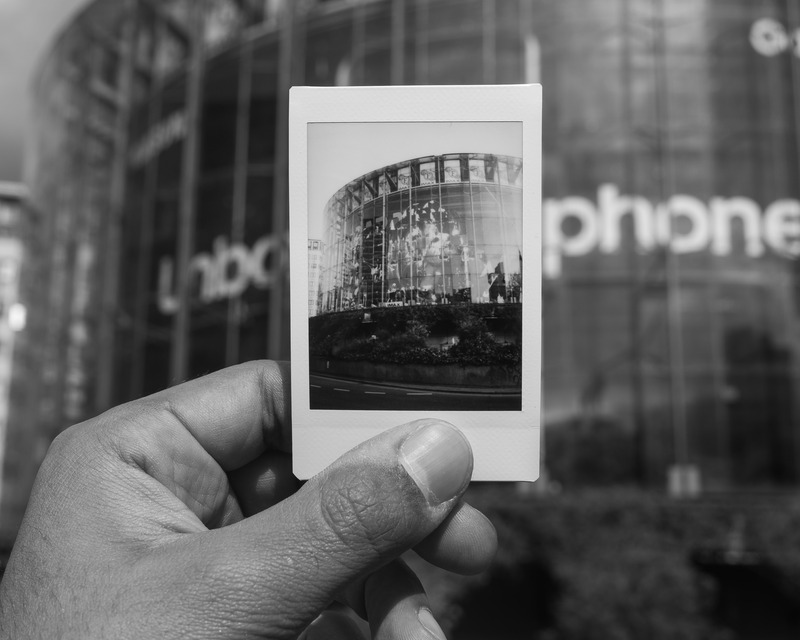 For me experimenting with another medium other than digital – in this case Instax film – was quite refreshing but the problem was how to take the basic Instax picture and use it to get my point across that the image nowadays is predominantly ephemeral. 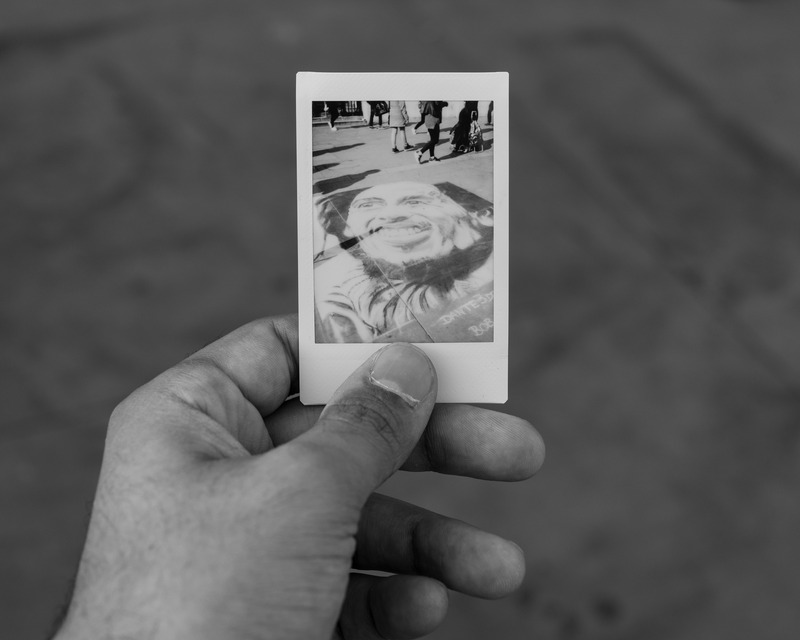 It took me a while to get used to the Instax film and camera for several reasons. Firstly the film itself used quite a high ISO exclusively (800 to be exact) which was good for lower light but in daylight often struggled to achieve a correctly exposed image. Therefore I found I had to wait for cloud cover or else accept part of the image would be overexposed. Secondly the dynamic range of the film was quite low so the lighting had to be quite even or otherwise the parted of the image would be underexposed while others would be overexposed. In the end I didn’t mind these traits as I felt they added some character to the images and the main subjects were still visible on the photographs. Thirdly, the camera always let out a flash burst, presumably for people shots in dark places where the camera was anticipated to be used. I had to be aware of getting to close to the subject or else the flash would overexpose it. Lastly the film was instant so I only had one shot for certain changing scenes as the film took roughly two minutes to develop before I judge whether the exposure setting had been correct. Once I had gotten accustomed to using the Instax camera I found this last point quite liberating as I was experienced with taking lots of shots from different angles of the same scene in quick succession. I got my point across that the image nowadays is predominantly ephemeral by making the Instax photographs appear inside an encompassing photograph taken with my DSLR. 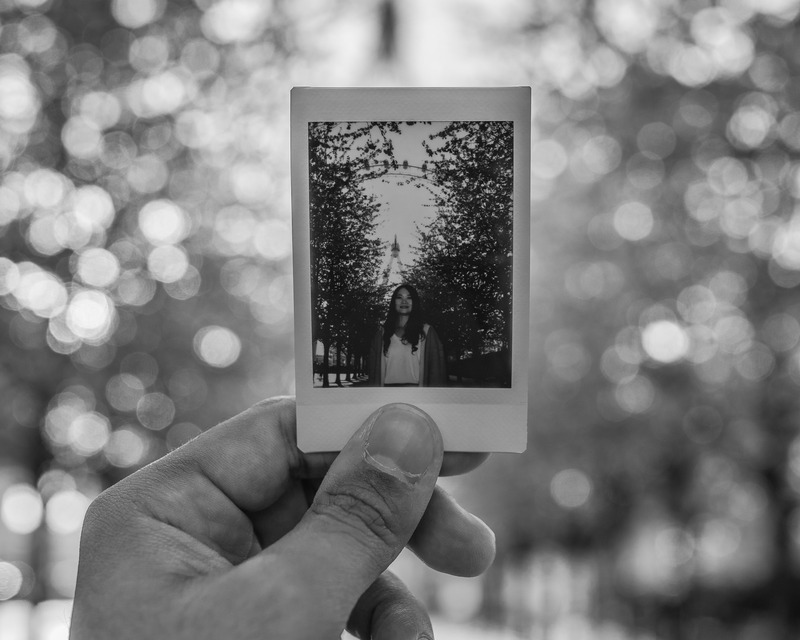 I chose to use a DSLR for the high image quality and to isolate effectively the Instax photograph from the rest of the encompassing photograph. The effect of this was that while the Instax photograph was undeniably indexical to the scene it reappeared in, things had since changed and so the viewer had to question the meaning of such changes on the overall photograph. I feel I used well people’s natural curiosity to see what the Instax photograph contained by mostly placing it in the middle of the encompassing photograph to draw the eye into the photograph. This is how I would suggest my images worked best at telling a narrative as the encompassing photograph had obviously changed since the Instax photograph was taken so the narrative was clear. In this way the 8 images worked as single-image narratives but also as a whole when put together. I felt technically I could have used a smaller aperture setting on some of the encompassing photograph shots as it wasn’t immediately clear what had since changed. I was particularly pleased with the way that I managed to present the images when put together in a visually striking manner. Although the brief had simply advised the work to be presented on a blog, I elaborated on this aspect of the brief well and it made the project more coherent. As well as this the Instagram style grid inside an empty picture frame pointed back to the ephemeral manner of the images. I thought the concept of ephemerality of the image was quite complexly visualised in my photographs and so therefore it was important to have a clear rationale and in the blog post with the images, which I felt I achieved. This was further expanded on in the post: Rationale for Assignment 2 – Documentary – Ephemerality of the Image. I thought the images on the whole worked better in black and white because it separated form from content so it was clearer to the viewer what the focus of the photographs were. Also the black and white medium for me reinforced the ‘truth’ factor behind the images as black and white photographs have been accepted as fact for a long time compared to colour. I would say the project was creative but the picture-in-picture idea was perhaps an obvious and overly direct way of representing my abstract concept. Having said this I felt it was well implemented, especially as I was influenced by the Droste effect in my presentation of my work as a whole. A big plus was the development of my idea – from experimenting with fleeting encounters in ‘Containment’, to the beginnings of taking an instant photo of people who then hold the instant photo and are rephotographed. This culminated with the development of this idea by adapting it to the instant photo showing an altered scene compared to the encompassing photograph. In terms of context I would suggest I could have researched more concerning similar artists who used pictures-in-picutres as I tended to rely on my assertions derived from Maartje van den Heuvel (2005)’s ‘Mirror of Visual Culture’ essay. Also if I had managed to complete more exercises leading up to the assignment I might have been better prepared for it; so wouldn’t have had to experiment and alter the project quite so much. However, the work I did complete, particularly van den Heuvel’s essay helped me get to a project I was eventually quite satisfied with. Van Den Heuvel (2005). Mirror of Visual Culture. Documentary Now! [online] Available at: https://www.oca-student.com/sites/default/files/oca-content/key-resources/res-files/heuvel_discussingdocumentary.pdf [Accessed 3/3/2017]. One aspect of my brief I had been given and I was quite interested in addressing was that the images had to appear on a blog. This interested me because I felt there was room for creativity in the brief requirement, especially in regards to my theme. I wasn’t sure whether I was perhaps reading too much into the fact I had been asked to display the images on a blog but I decided I would respond to this part of the brief in a creative manner. As my theme (ephemerality of the image) dealt with the image changing, the manner in which it appeared was quite important. A blog is one way virtual images are displayed amongst others in social media. Social media is the predominant way images are viewed nowadays and so relevant to my theme as it is also constantly changing. I felt there was some way to display my imaged creatively on the blog although I could not pinpoint which way until after I had taken most of the 8 images for the assignment. I imagined initially the images appearing on a kind of 4×2 grid with each image clickable on the grid. I soon realised this wasn’t possible (at least with my version of WordPress). However, I thought up workarounds and in the meantime performed a quick search on the internet regarding creative ways to display images on a blog. Although I didn’t come across any answers which directly responded to my question, I sort of came across one web page article linking another which was a different yet better outcome than I had been hoping for. The website linking the other was by Martha Palk. (Palk et al., 2016) had helpfully listed 10 Creative Ways to Display Your Photos and the one that caught my attention was the ‘Instagram style’ option. (Palk et al., 2016) also credited and linked the source so I went onto the article I was interested in. The website I was linked to was littleinspiration.com and I found to my delight it listed materials needed and instructions on how to make a way of displaying your Instagram photos. The reason it caught my attention was that when I saw the first two pictures of the Instagram ‘empty frame’ containing the Instagram photos, my mind started whirling with possibilities for displaying the 8 photos I’d taken for the assignment. I could feasibly make a grid of 4×2 for the 8 photos for inside a frame as detailed on http://littleinspiration.com/2013/04/instagram-project-how-to-display-your-instagram-pictures.html (accessed 27th April 2017). Although this wouldn’t be displayed on a blog directly I could then photograph the frame and its contents and display this on my blog. The idea was to highlight one of the 8 photographs displayed inside the frame using Photoshop by darkening the rest of them. The photo highlighted I would then link to the full resolution equivalent of that photo. After that I would repeat the process with the 7 remaining images in the frame until all 8 photos linked back to their respective equivalents. These would all be presented in a list on a blog post. Finally I would put up the frame photograph with the grid in it without alteration. Palk, M., Tailor, S., Tailor, S. and Copleston, S. (2016). 10 Creative Ways to Display Your Photos | The House Shop Blog. [online] Thehouseshop.com. Available at: https://www.thehouseshop.com/property-blog/10-creative-ways-to-display-your-photos/6662/ [Accessed 28 Apr. 2017]. Little Inspiration. (2013). 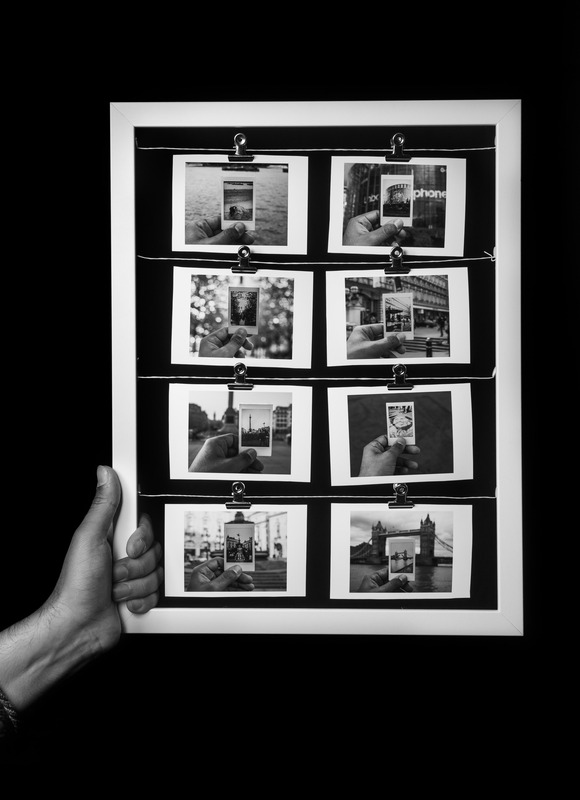 Instagram Project: How To Display Your Instagram Pictures. [online] Available at: http://littleinspiration.com/2013/04/instagram-project-how-to-display-your-instagram-pictures.html [Accessed 28 Apr. 2017]. By including a picture within a picture where the original has since changed in the encompassing picture, I have been creating simulacra – copies without originals. The locations (in London) are still recognisable as the same from picture-in-picture to encompassing picture but the place has in some way been altered. These alterations vary in my chosen location; from people being present in the picture-in-picture and then absent in the encompassing picture or street art having been washed away over night. The inclusion of my hand symbolises my relation to the photos and the location they were photographed in. I have chosen to display the images produced as one grid – utilising the Droste effect to further get my point across that nowadays the image is largely ephemeral. This is due to the prevalence of social media which drives the high consumption and quick turnover of image based material like photographs by other people. Once the thumbnail has been clicked on the highlighted picture within the picture frame it will link to a high resolution image which is the corresponding image. I have linked the images like this so the viewer can get a more detailed view of each image as well as the bigger picture. Lastly I have linked the unaltered bigger picture to a high resolution version of itself. I had become interested in the idea that photographs could be a mirror of visual culture after reading ‘Mirror of Visual Culture’ by Maartje van den Heuvel (2005). I asserted from van den Heuvel’s essay that it is possible for a photograph to contain properties that mirror photographs in general. One of the properties of photographs, more pertinent nowadays, is ephemerality. 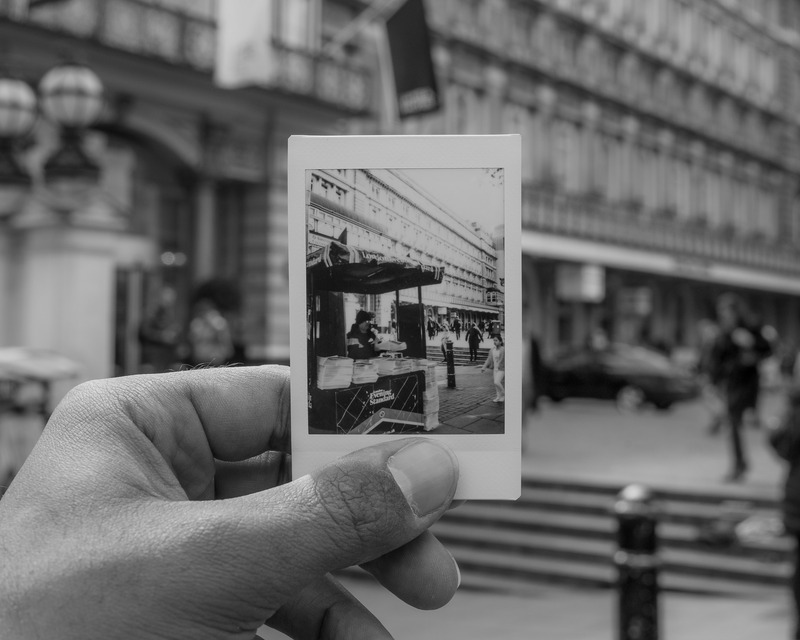 Since the advent of digital photography the number of photographs being taken and shared has spiralled upwards dramatically and coincidentally the effective duration of many photographs once shared has decreased. They become forgotten after a few days of being popular on the sharing platforms (even though they are still accessible). A way I foresaw of challenging this notion of ‘ephemerality of the image’ directly was to allow a photographic image to appear in another photograph. The rhetoric behind this was that the photograph represented something of the place it reappeared in and so was indexical to the photograph being taken. As well as this the photograph being taken was indexical to the place. The photograph appearing inside another photograph in the same place the original photograph was taken has been done many times before. However, what set my photographs apart, I believed, were that whatever had taken place in the photographs within photographs had since changed dramatically. In this way the place had been recorded by the photograph as a simulacrum – a copy without an original. 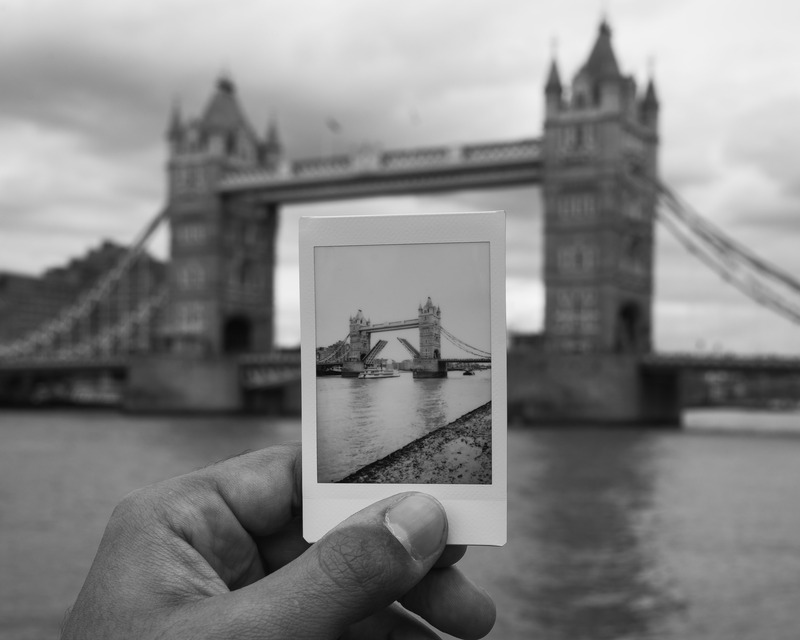 Initially I was going to get people like tourists to hold their own picture I’d taken with a ‘Fujifilm Instax Mini 8’ camera in the same place it was taken, from which I would take another picture with my DSLR of them holding the instant photo. 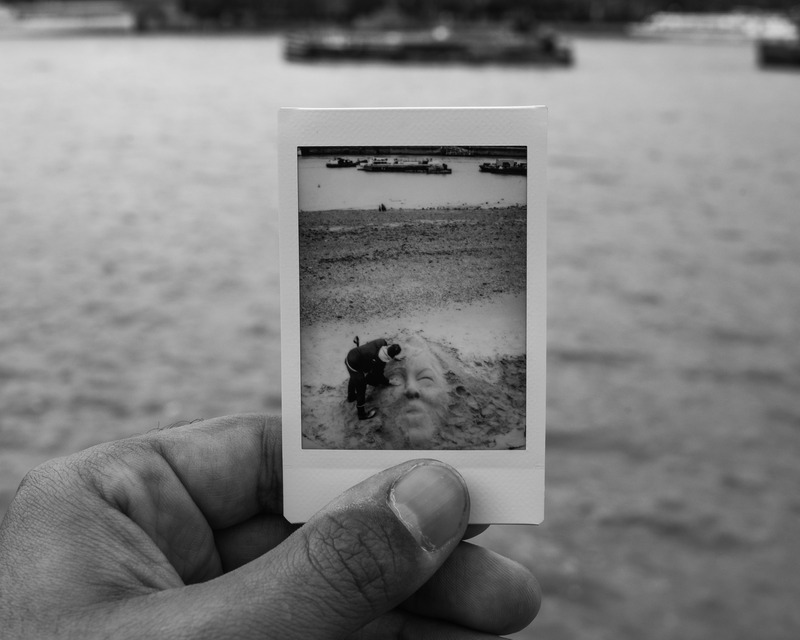 The idea behind these images was that the person via the instant photo they were holding proved their presence in that place. I tested this idea out on family members and it worked quite well but when I tried to actually carry out the idea in public spaces with tourists I found it didn’t work so well. 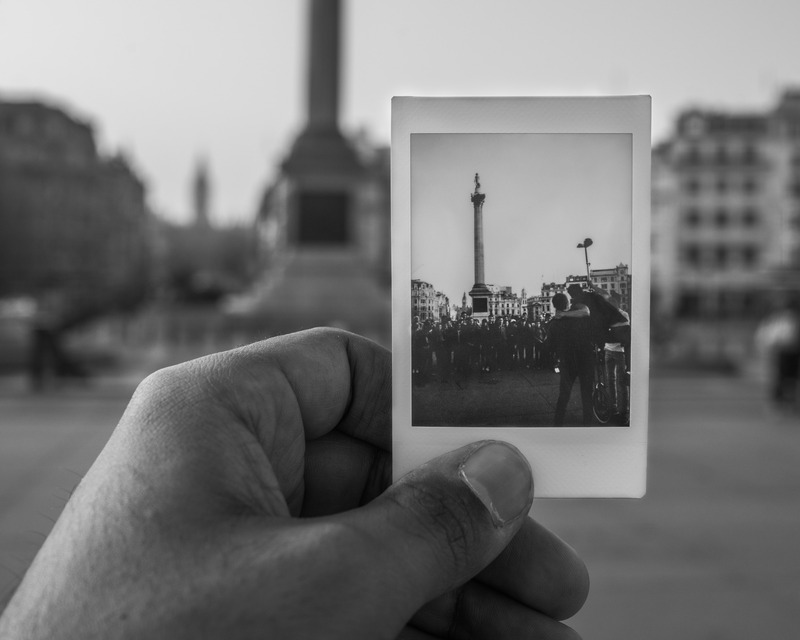 It didn’t work well because I wasn’t confident enough to ask the tourists whether they would wait for two minutes for the photo to develop for them to then hold it and pose again. Also I realised that of course not a lot had changed in the time it had taken for the instant photo to develop which meant there wasn’t much point to taking the photographs. I decided to look closely at what I could change in my project and found that getting the people to hold the instant photograph and posing again wasn’t necessary. Instead I myself could hold the instant photograph and simultaneously photograph a changed scene which assumed a sense of absence in the resultant photograph. Soon after I grasped that the subject of the photograph didn’t have to be a person to reveal change in the city. I was much more comfortable photographing non-human subjects which although not pushing me particularly out of my comfort zone was more practical. I discovered to my tastes the absence of something because it has since changed in this developed idea (with myself holding the instant photos) was more powerful than reconfirming the presence of something (like in the original idea). Furthermore I felt this approach reflected the ephemerality of the image more in line with my assignment brief I’d set myself. I also decided to use the ‘Fujifilm Instax Mini 8′ camera to give the photographs that appeared within the overall photograph some kind of instant feel to them. As my idea developed I realised that the instantaneity of the film which developed in about two minutes was not strictly necessary anymore. I could have used a much larger, non-instant film or digital camera to document the changes occurring in the city. However I decided to keep using the instant film camera because of the form factor of the images produced by the instant camera. The things I liked about the form factor of the images produced were the size and quality of image. The size was inherent in this kind of instant film camera and I felt added a kind of nostalgic character to the eventual images when the (small) instant photos appeared inside them. The nostalgic character came from the fact that they were so small with distinctive white borders which was indicative of instant photographs. Therefore they didn’t line up very well with the location that were shot in in the eventual photographs but did fit in well with the idea of the tourist culture in London. The quality of the image was quite low but I felt this added further nostalgic character to the images. If I would have taken the photographs appearing in the eventual photographs with a much better quality film and camera, the changing places would have seemed less ephemeral. This further raised questions for the viewer of how the place could be so ephemeral and what implications this might have for the photograph appearing in the place. The location for each photograph was in the centre of London. I chose this location because with all the tourists and activity in London, the place changes very quickly and so seemed a good location to carry out the project. Also tourists I felt would be the ones using such cameras to document their time in London or another popular tourist destination so my target audience would be able to better relate to the photographs. My target audience was anyone who could relate to the ephemerality of images on social media. Furthermore my target audience was especially people who live in the same city and could associate change in the city occurring quickly too. From my perspective, taking the photographs, I felt like an insider tourist – one who had observed the often obscure ephemeral changes in the city and who wanted to document them in a similar manner.